I want to try this mod but it doesn't have any install instructions. I think its great that you've let the Caretaker take over the mod and it's a great thing the Caretaker is doing, but on a lot of these mods of 'his' he doesn't include any install instructions. Well now I have a better way to play my VR Cardboard Skyrim, trying to play via keyboard is a bit tout putting to do. With this, I can Move a bit more when playing. I would put what program I use for my game, but don't know if that is allowed. X-padder does seem to lag a little sometimes, plus it gets stuck on the LT/RT toggles sometimes. I'm gonna check this out on my next play through. Hi does it work with a 360 xbox controller, too? If I understood correctly, can I for example play normally in control and configure for example the powers on some keyboard button ?! it is? wait - does this mean i can use my logitech pad to control dev aveza? http://www.nexusmods.com/skyrim/mods/24234/? - and still use my keyboard at the same time? Does this mod work with xbox one pads too? 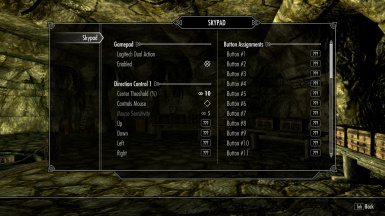 I have no idea, the reason I made this mod is because I don't have one and I wanted a simpler approach for configuring non-xbox gamepads in Skyrim. Just had to say Thank You Very Much for this, me and my brother been playing skyrim+other games on computer for about 3 years i guess, i know i have other mods downloaded from you, you are a genius again thank you!!!!!!!!!!!!!!! !